Now that I've finally caught up with my London reviews (with a few more yet to come), I was excited to turn my sights back stateside and resume exploring gluten-free eats in my own backyard. Whenever anyone asks me about where to eat out in Washington DC, Chaia Tacos is more often than not my first recommendation. 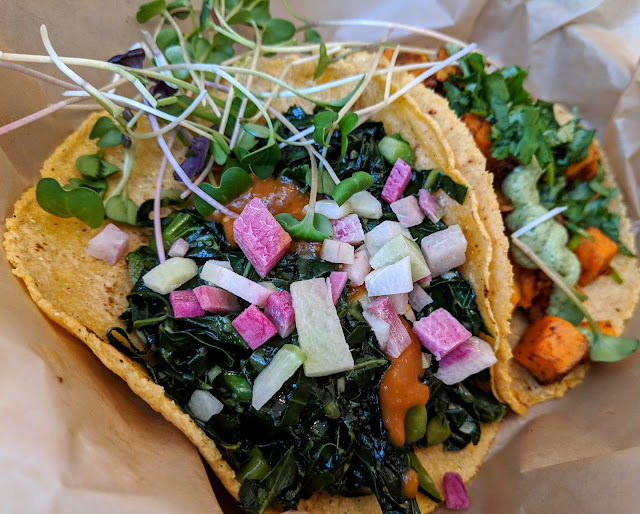 With an entirely gluten-free menu and innovative take on vegetarian tacos that is downright inspired, they have every box checked when it comes to my idea of a perfect restaurant. That being said, my one and only complaint over the years has been that their Georgetown location, albeit cute and homey, is just too far out of the way of my daily life to make visits to Chaia a regular habit. That all changed however when they opened up their second location in the more centrally located Chinatown. 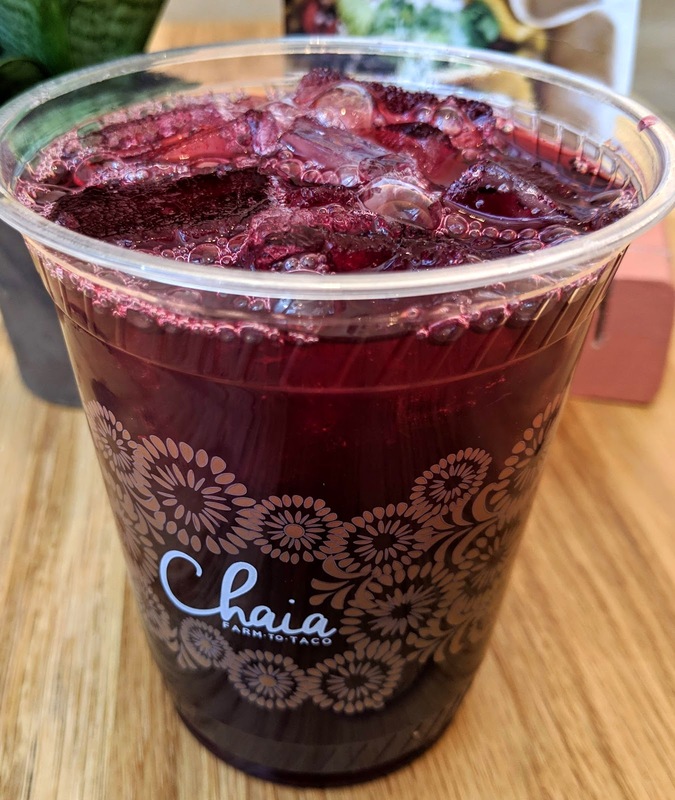 Now with Chaia just blocks from my office, I was more than ready to rekindle my love affair with them, and write an updated review, since my last review was written several years ago. 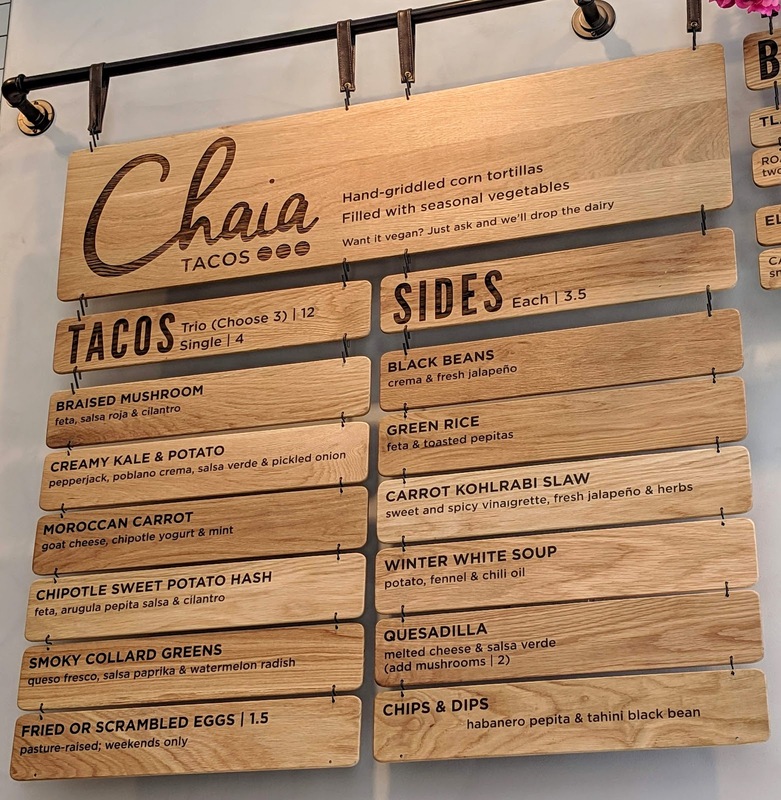 Since my initial Chaia review, they have expanded their menu, which now features street food selections, rice bowls, and a full array of sides in addition to their veggie tacos. Everything on the menu is seasonally inspired, so the menu can and will change throughout the year (even more reason for frequent visits!). While dairy is included in some menu items, vegans and dairy-free folks need only to request to drop the dairy from any menu item to make it safe. 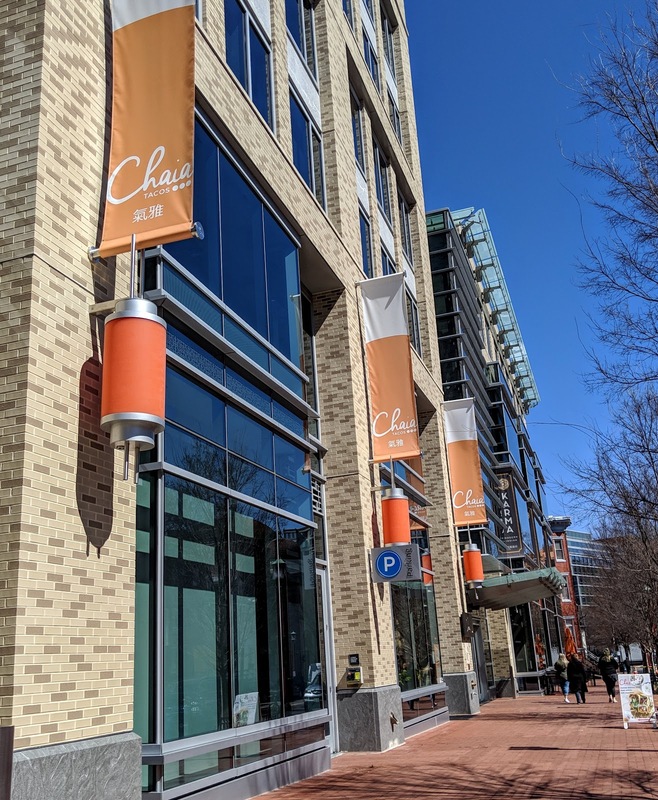 Another amazing allergy note is that Chaia is not only 100% gluten-free, but also completely free from nuts, so this is definitely a safe pick if you have multiple restrictions, or want to dine out with a group with mixed special diets. I decided to sample around the menu, selecting a pair of tacos (smoky collard greens and chipotle sweet potato hash), a side of black beans, and their signature iced hibiscus tea. The smoky collard taco featured a spicy paprika salsa and crisp watermelon radish. The star of the show was definitely the greens themselves, as Chaia prepared them in a way where their bitterness was dialed back with the addition of smoky and garlicky notes. Despite the taco fillings being weighty and generously portioned, the homemade corn tortilla performed admirably from first bite to last, and I appreciated the fresh-griddled flavor and thickness of the tortillas. The second taco I tried was the chipotle sweet potato hash, which features an arugula pepita salsa and cilantro. What was showstopping about this taco was the complexity of spices that complemented the roasted potato. I just wanted to close my eyes and take in every taste and texture, and the creamy salsa and cilantro fleshed out the flavors of the taco into a full-fledged symphony. 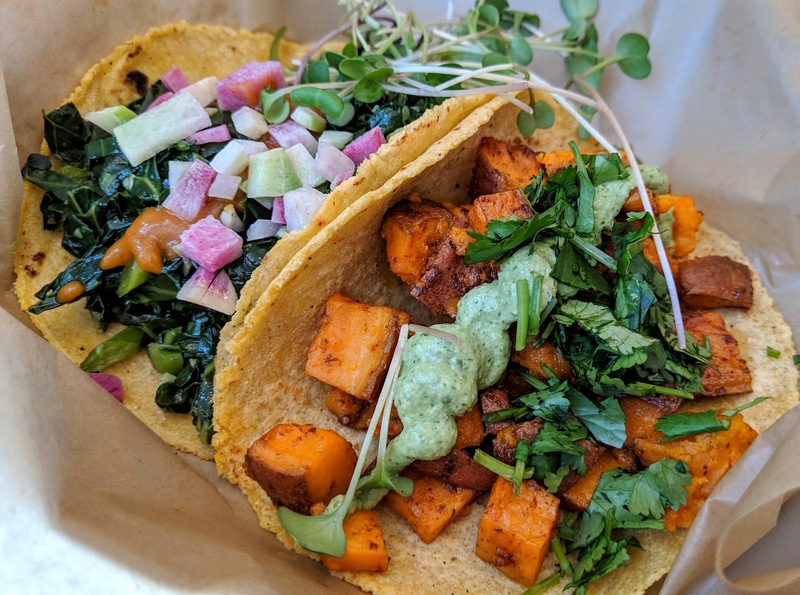 Of the two tacos I tried, both were clearly crafted with care with top-quality ingredients, but I have to say the sweet potato taco stole the spotlight and my heart. As a side dish, I ordered the black beans, which are topped with jalapeño peppers for an added kick. Now the gold standard for black beans in my opinion are the Cuban-style black beans I grew up with in Florida that are stewed so long they achieve a creamy texture and complex flavor. I have not fount a parallel to those beans outside the sunshine state until now. Chaia's beans are thick and creamy, and the jalapeño provides a dash of heat to offset the heartiness of the beans. 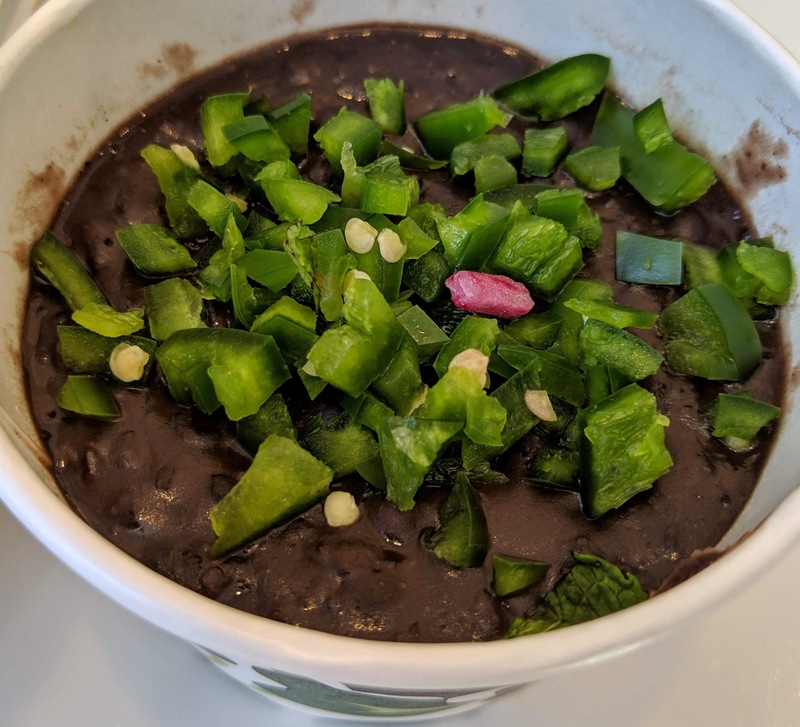 Yes, black beans are among the simplest foods to prepare, but Chaia's elevates this humble legume to an art form, and I was totally there for it. Of course no visit to Chaia is complete without ordering their signature hibiscus tea. With an intense floral flavor and lightly sweetened to complement the savory items I ordered but not overpower them, this tea seals the deal on a showstopping, unforgettable meal. I know at some point I need to branch out and try their other handcrafted beverages, but every time it comes to the decision point when placing an order, I can't turn away from this perfection. 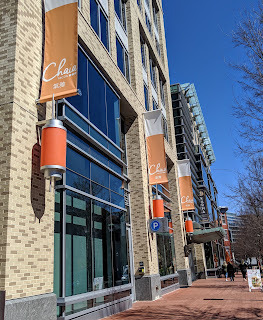 I am so happy to report that all these years (and a second location) later Chaia remains a fierce competitor for the best gluten-free restaurant in the whole District. It's downright dangerous that they are now so conveniently close to my workplace, because I am forecasting far more Chaia in my life (which isn't a bad thing at all). Don't let the slightly higher-than-their-competetors prices fool you, Chaia's menu has the care, intention, and quality ingredients that is rare to find these days (plus it earns bonus points for being so special diet friendly). 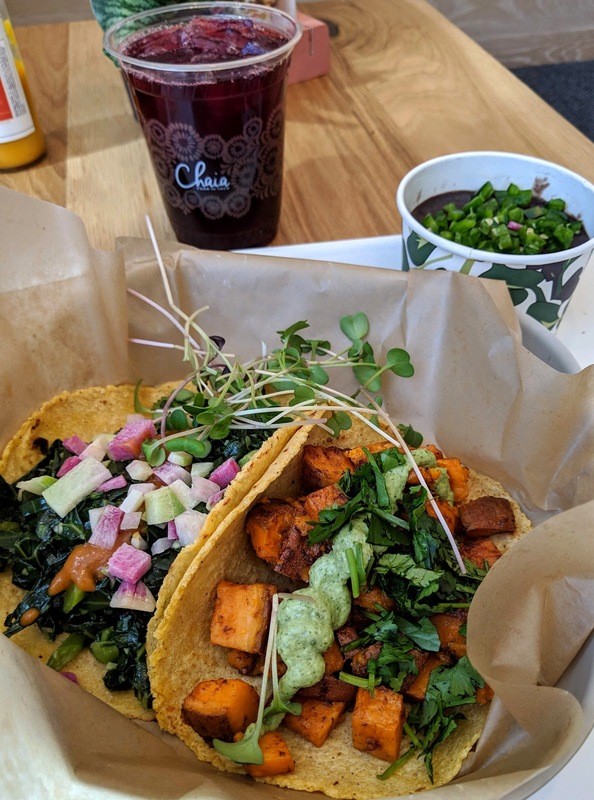 Proving that veggie tacos can and should be taken seriously, Chaia makes their case in a definitive fashion.